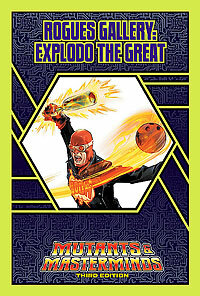 Extroverted, egotistical, reckless, and interested in having a good time, Explodo the Great is a villain because he can be! He steals because it’s easy, blows things up because it looks cool, and terrorizes the population to show off. He typically warns people when the explosions are about to start, so it’s hardly his fault if they don’t run fast enough! Explodo is part fun, part crazy, and a whole lot of trouble! Get Explodo today, for just $1.95!